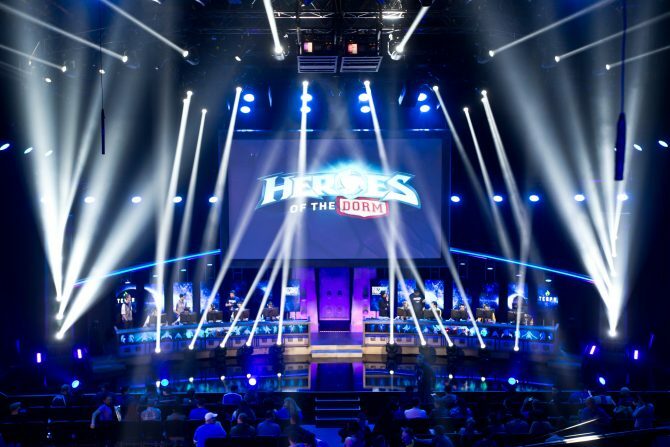 The Heroic Four of the 2018 Heroes of the Dorm National Championship face-off at Blizzard Arena to crown this year's champion. The 2018 Heroes of the Dorm National Championships have come to a close. 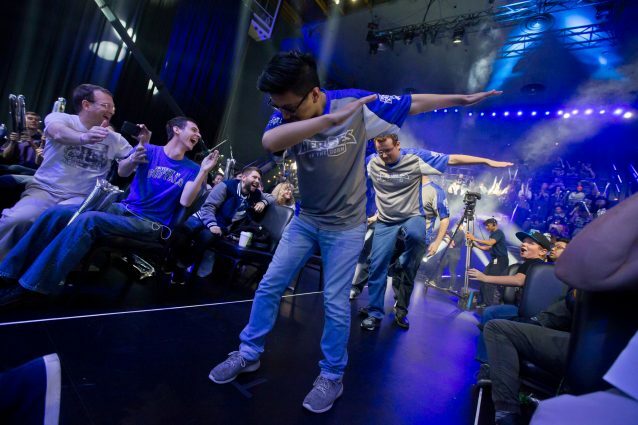 The best four teams in the tournament — which includes Université Laval, University of Kentucky, University at Buffalo, and California Polytechnic State University – Pomona — got on stage at the Blizzard Arena in Los Angeles to play some competitive Heroes of the Storm to become this year’s champions for the collegiate eSports tournament and earn enough cash to cover the rest of their tuition. Each match is a best-of-5 series where both teams will submit their bans, pick their heroes, and attempt to destroy the Nexus at the opposing team’s side. 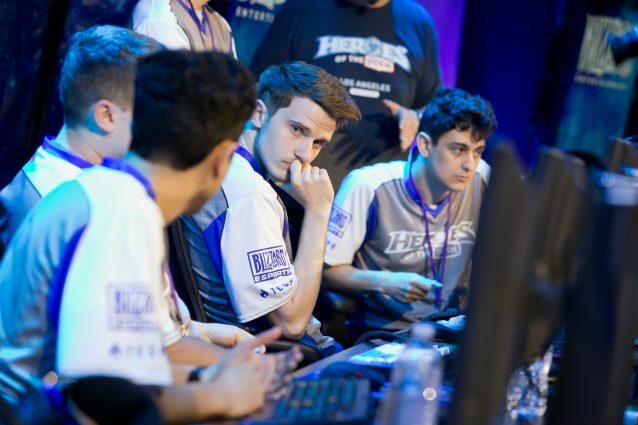 The winners from the first two matches then go head-to-head in the Grand Finals where they will be crowned the heroes of the dorm. The match-up between the University of Kentucky and Université Laval would be considered evenly matched — they are the number 3 and 2 seed respectively — but looking at the display shown, you wouldn’t be able to tell due to Laval’s dominant play. The first match was on Dragon Shire where the French Canadian team absolutely killed it. Although it was a bit scrappy, both Wouka and Earth brought their “A” game racking up kills and aiding their team to get the level advantage. 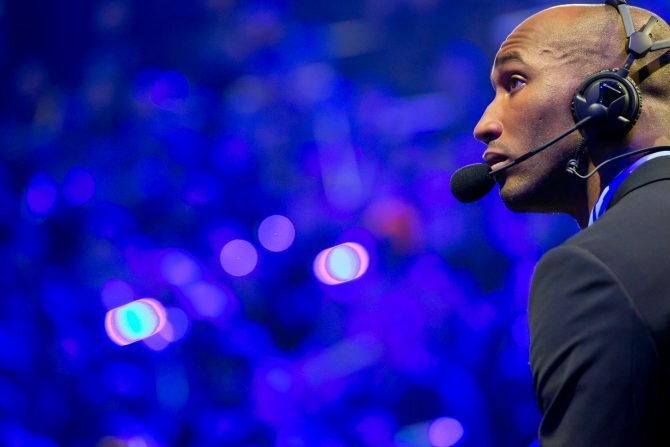 At no point did UK have a chance as they failed to commit during team fights and could not attain a Dragon Knight. The second match, set on Infernal Shrines, told a similar story but we saw a bit more coordination from both teams. UK started strong garnering the first Punisher, but that momentum quickly came to a halt when Laval won the team fight and got a Punisher of their own. From that point on, the French Canadian team steamrolled UK with ease and ended the match in just 14 minutes. Laval continued to show their dominance in the third game securing the win and a spot in the Grand Finals. Again, UK showed some promise at the Tomb of the Spider Queen in the very beginning of the match but quickly changed once Laval gained momentum and UK missed way too many opportunities to really take the match. Too many times did someone on UK land a great ult, but had nothing to follow through with. University at Buffalo was the underdog in all of this. They are the 8th seed in the tournament and didn’t perform as well as the rest of the competition in the tournament. California Polytechnic State University – Pomona was definitely a favorite to go to the Grand Finals. Opening the match, both teams find themselves at Cursed Hollow. Buffalo starts out strong looking like they might actually win the first game. However, they get sloppy later and Cal Poly takes advantage of their missteps. Pomona’s coordination was on point and was able to pull out the first win. In the second match, set on Tomb of the Spider Queen, we see a surprise pick bringing Heroes of the Storm‘s newest character, Deckard Cain, out on the battlefield. Buffalo has the advantage throughout most of the match, even after Cal Poly gets first blood 9 minutes into the game. It seemed like Cal Poly didn’t have the confidence in team fights. Buffalo was able to coordinate their attacks with more finesse leading to their first victory in the series. The third match saw some interesting picks with Medivh somehow making it through the banning process on the side of Buffalo. 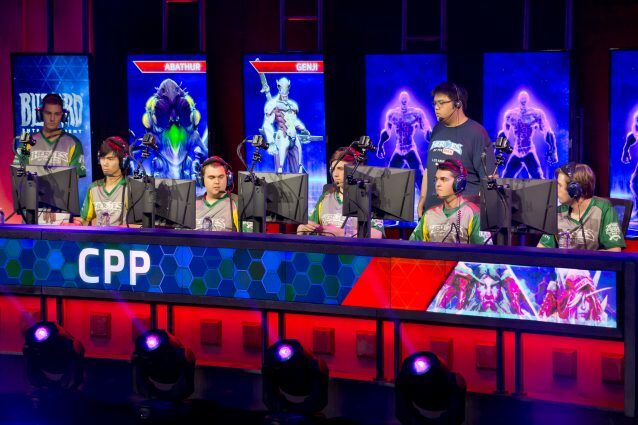 The composition of Cal Poly’s team — which includes, Genji, Abathur, Li-Ming, Johanna, and Blaze — was questionable but, in some ways, works out for them. As predicted, Buffalo starts strong with the first kills along with getting the first objective. Cal Poly picks up some momentum when they win a team fight they probably shouldn’t have won; everyone on the Ponies was stunned but no one on Buffalo followed up leading to four kills and a level advantage for Cal Poly. The match was pretty tight throughout the entirety of the game and filled with some great team fights, with the last one leading to Buffalo grabbing the objective and grabbing their second win. The odd picks continue in game 4 with Cho’gall and Alexstraza on Cal Poly and Chen and Anub’arak on Buffalo at Braxis Holdout. Surprisingly, Cal Poly’s comp really works out for them. The Cho’gall was an incredibly effective choice, destroying just about everything in its path. The late addition of the two-headed monstrosity didn’t allow for Buffalo to create a team composition that can cut Cho’gall down. It was hilarious to see it basically take out the Nexus all by himself. Cal Poly wins it in the most entertaining game of the tournament. Although I’m sure everyone wanted to see Cho’gall get picked again and it seemed like they were going in that direction — that wasn’t the case. Going into its fifth and final match, Buffalo had Cal Poly’s number and was able to pull out a win getting a spot in the Grand Finals. The last matchup of the night. Université Laval has been a dominant force throughout the tournament, and they had no intention of slowing down with a shutout in the first match. However, University of Buffalo has earned their spot here in the Grand Finals proving that they were also a force to reckon with. Plain and simple, Laval are just the better team. Buffalo seemed like they would be on an even playing field with their performance but found themselves at a level disadvantage in the late game. In both matches, Laval was more coordinated in team fights; even when they looked like they were losing, they would come out with more experience with the opposition running away from them. 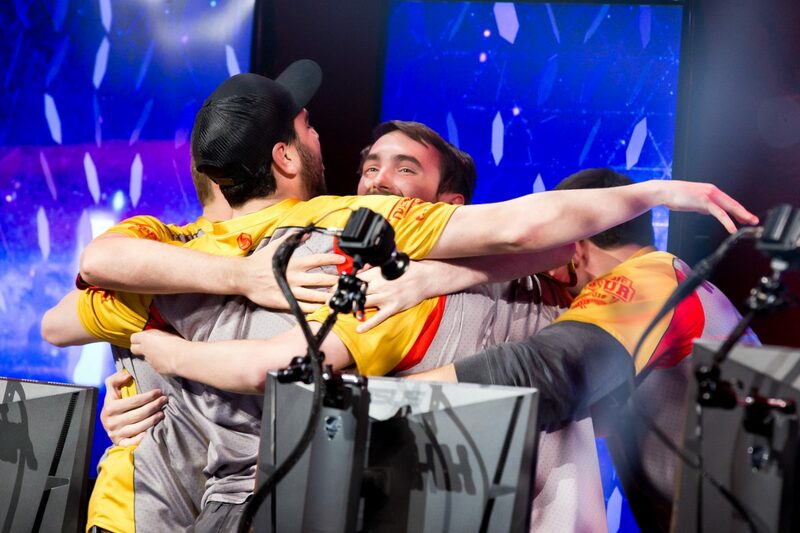 Needless to say, Université Laval was a powerhouse after being undefeated throughout the 2018 Heroes of the Dorm National Championships. That doesn’t mean that they didn’t have a hard time with the series’ underdogs, University at Buffalo. 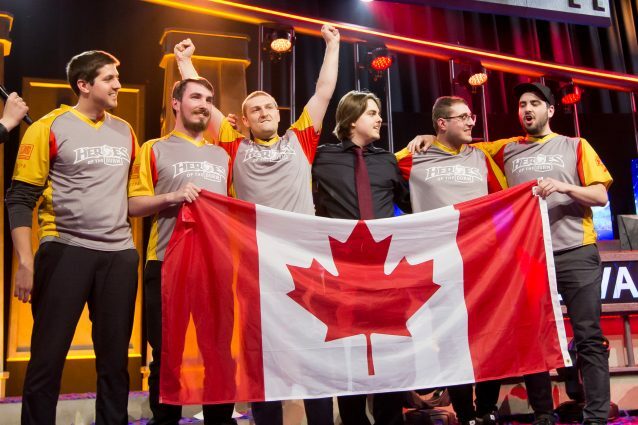 This also marks the first time in Heroes of the Dorm history a Canadian team won the tournament. For winning Heroes of the Dorm, they won enough money to pay off the rest of their tuition, which anyone could understand is a huge weight lifted from each of the player’s shoulders. 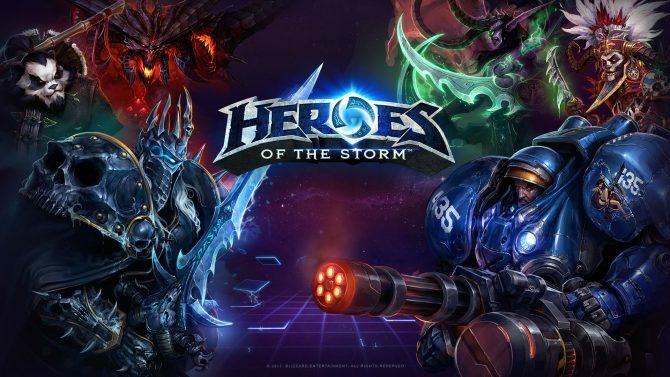 Blizzard has announced that they will be shifting developers from Heroes of the Storm to other internal teams and has cancelled future eSports events.